Weekly Match Brings Your Colorful Underwater Wins From Monday through Thursday! Sharks speed past, tuna swarm in huge, glittering schools and sea turtles swim lazily across the 5 reels of Mr. Sloto's latest addition: Megaquarium! And we'd like to welcome March and Spring by giving you the chance to spin this colorful slot with a 100% Match plus 75 Free Spins! Will pay out 7 free games with prizes doubled. 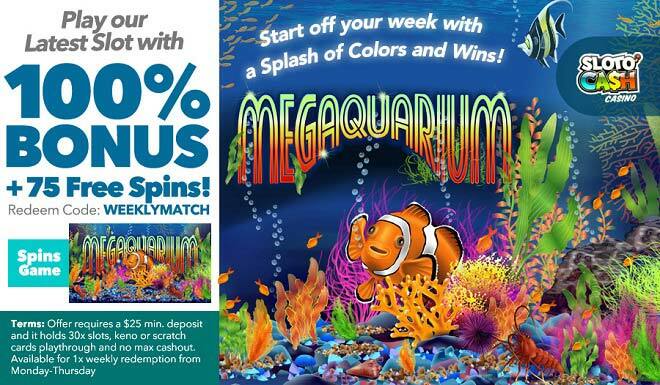 Stunningly bright colored wins are what Spring is all about - deposit $25 and claim your 100% Match + 75 Free Megaquarium wins! Play 100% Bonus + 75 Free Spins! Offer requires a $25 min. deposit and it holds 30x slots, keno or scratch cards playthrough and no max cashout. Available for 1x weekly redemption from Monday-Thursday.